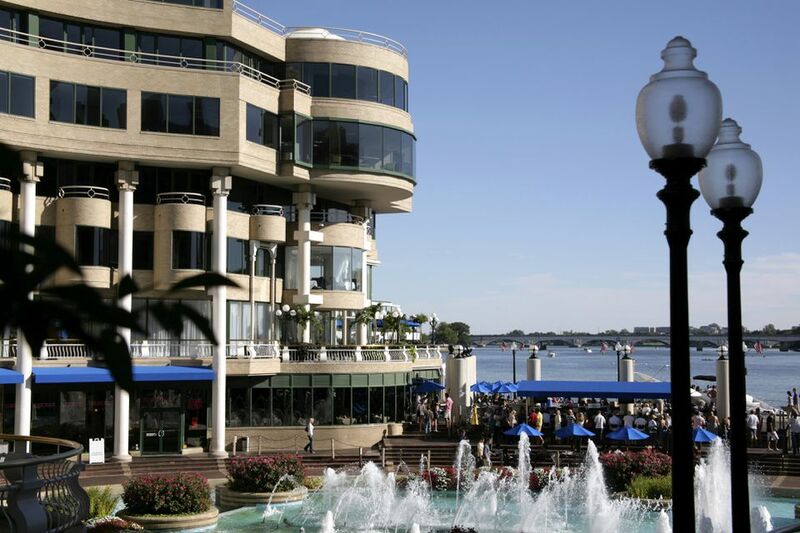 Washington Harbor is a prime dining destination in Georgetown that offers spectacular views of the Potomac River. Visitors can see views of the Kennedy Center, Roosevelt Island, and the Key Bridge while dining at a waterfront restaurant. With large outdoor patios and floor to ceiling windows, diners can enjoy a spectacular ambiance year-round. This historic Georgetown location features luxury condominiums, office space, a public boardwalk and waterfront restaurants that offer seasonal outdoor dining and Sunday brunch. Georgetown Waterfront Park sits adjacent to the restaurants and is a nice place to take a stroll before or after your meal. Sequoia - 3000 K St. NW, Washington, DC (202) 944-4200. The restaurant offers contemporary American cuisine and is especially popular for happy hour and brunch during the summer months. The floor to ceiling windows offers a magnificent view of the Potomac River. The outdoor patio is a prime spot to enjoy lunch or dinner on a warm day. Tony & Joes Seafood - 3050 K St. NW, Washington, DC (202) 944-4545. The seafood restaurant has an open floor plan with a focus on the waterfront view. The menu includes a wide range of seafood from Maryland Style Crab Cakes to New England Grilled SwordFish, to Whole Maine Lobster to Blackened Mahi Mahi from the Gulf of Mexico. Visit on Sundays for their award-winning brunch buffet. Bangkok Joes Dumpling Bar - 3050 K St NW Washington DC (202) 333-4422. The restaurant offers traditional Thai cuisine with a modern American twist. Dishes incorporate the exotic tastes and aromas of Bangkok street food along with the Japanese, Chinese, Vietnamese and French flavors. Nick’s Riverside Grill - 3050 K St. NW, Washington DC (202) 342-3535. The casual American restaurant features salads, sandwiches, and entrees such as grilled salmon, blackened cowboy ribeye and Maryland crab cakes. The design is a split level with a large bar, a fireplace and dining rooms that overlook the Potomac River and the fountain side of the harbor. Farmers Fishers Bakers - 3000 K St. NW, Washington DC (202) 298-TRUE (8783). The restaurant features American Farmhouse style dining in a modern, upscale casual, and eco-friendly setting. There is an in-house bakery, sushi counter, and a full bar with 24 beer taps. The restaurant is owned by the more than 40,000 family farmers of North Dakota Farmers Union (NDFU) and is supplied by hundreds of family farmers everywhere. Fiola Mare - 3050 K St. NW Washington DC (202) 628-0065. The restaurant specializes in Italian and Mediterranean seafood prepared with elegant simplicity and paired with the finest wines. The menus are based on the finest, freshest ingredients available and therefore change daily and seasonally. Cafe Cantina and Pizza Pino - 3050 K St. NW Washington DC. Upper Plaza (202) 965-3052. Gelateria Dolce Vita - 3050 K St. NW Washington DC. Upper Plaza (202) 298-8331. The Best Sandwich Place - 3050 K St. NW Washington DC. Upper Plaza (202) 298-0417. Washington Harbour has garage parking that is operated by Colonial Parking. The garage is located at 3000K St NW, in the Washington Harbor’s East Building. The entrance is on K St between 30th and Thomas Jefferson St.